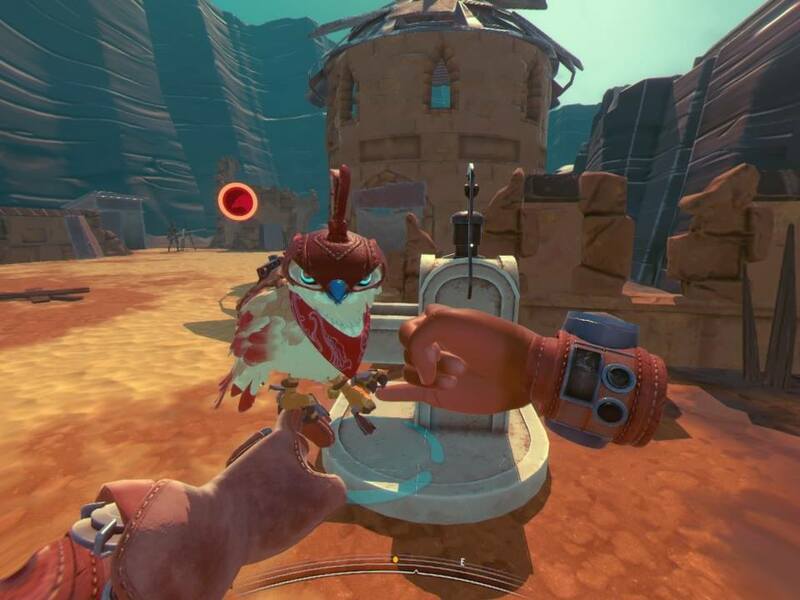 The amount of enjoyment to be found in Falcon Age, a falcon-hunting adventure game for PlayStation 4 and PlayStation VR, depends on how much one falls in love with its feathered co-protagonist. Fortunately, the bird is ridiculously lovable. 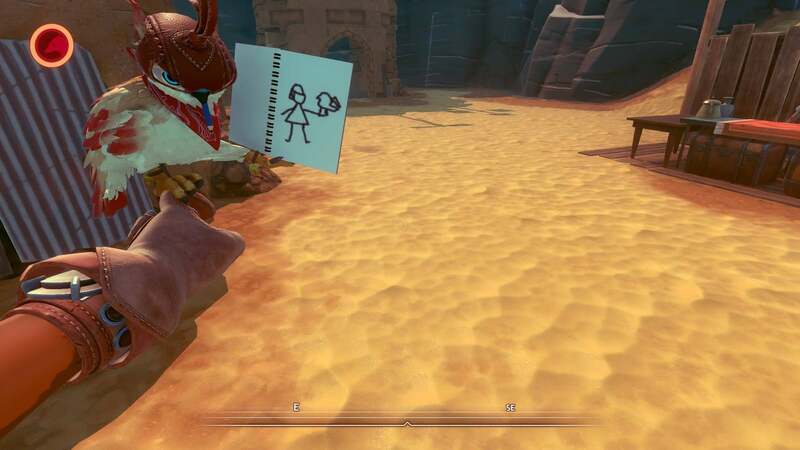 Falcon Age is a game about the relationship between human girl Ara and her bird, or at least that’s the part that really matters. The humans of Ara’s world have been subjugated by robotic colonisers from another planet, slowly taking over the beautiful desert world with smoke-spewing industrial plants. Ara aims to shut down the mechanised refineries and reclaim the land. With her best bird by her side, she battles robots and flips switches, shutting down the industrial complex in the name of her people. There isn't a lot to Falcon Age’s story. There are three refineries to shut down, which doesn’t take long. There’s a dramatic rescue that winds up being unnecessary, and then, after the players perform a final action I will not spoil, the game ends. From start to finish my first playthrough of Falcon Age lasted around three hours. There are a couple of side missions Ara picks up from other characters, and there’s a conflict between Ara’s resistance-minded aunt and her corporation-loving mum that doesn’t end up going anywhere. I would have liked to get to know the world better. But that’s okay, because I got to know Ara’s bird companion. I chose to name her Damini, and she’s my bird of prey. My alien raptor. No relation to former Kotaku US managing editor Tina Amini, but secretly her bird-sister. 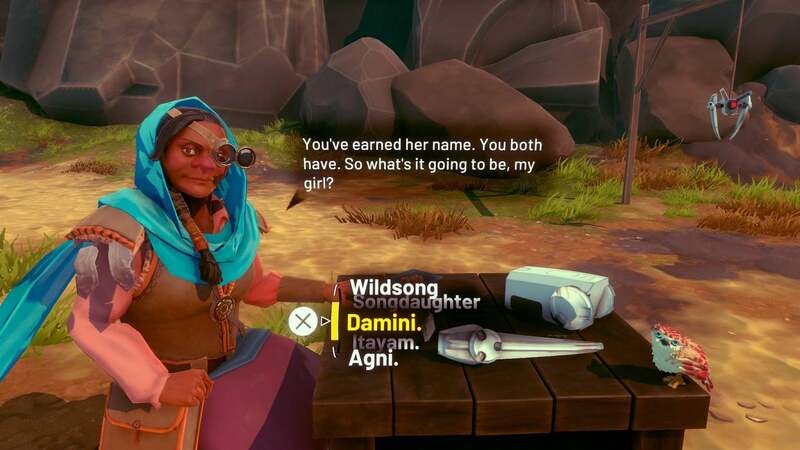 Damini is the most endearing creature I’ve come across on my PlayStation 4. 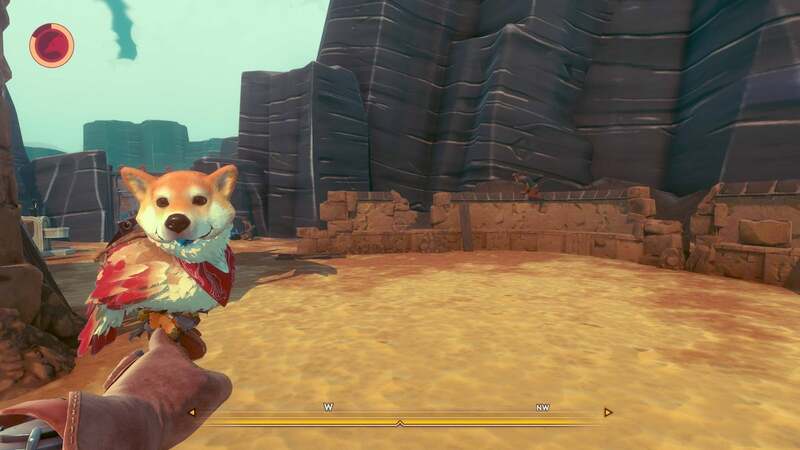 Developer Outerloop Games, inspired in part by golden eagle hunting videos, created a delightful animal companion both on the television screen and in virtual reality. Forget the robots. Forget the resistance. Forget Ara’s mum and her insistence on showing her daughter pictures of dogs, cats and other pets she could own if she just fell in line. 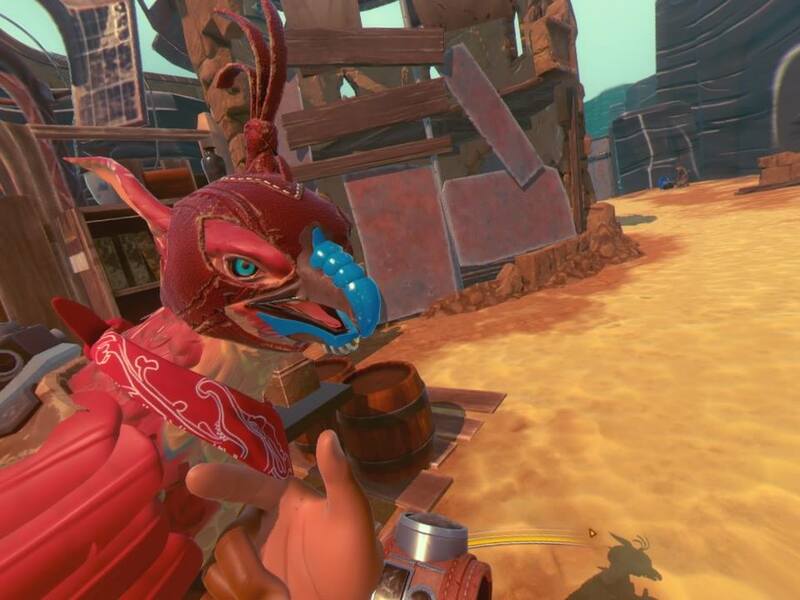 Falcon Age is about whistling for your bird and having her light upon your outstretched arm. It’s about ruffling her feathers with your fingers. It’s about collecting toys as rewards from other characters that make the bird sketch pictures or skateboard. It’s about dressing her up in dog hats. Everything Ara, and by extension the player, does with Damini, or whatever she’s named, is joy. Siccing her on colourful alien goat creatures and watching her lift them up and slam them to the ground? Joy. Sending her after wild peppers growing on cliffsides, then having her on your hand with the vegetable in her little paw? Awesome. Arming her with digging claws and using her to clear land mines? That part’s kind of tedious actually, especially since the landmines respawn for some reason, but it’s not completely bereft of joy. In a recent post on the PlayStation Blog, creative director Chandana Ekanayake goes into minute detail about how the bird was built, animated and textured to look and feel as real as an alien hawk creature could get. I particularly love the way they used a ball to simulate the player’s hand in determining how Damini would animate while perched on a moving fist. The way her head stays still and focused while her body moves is enthralling. They’ve built an outstanding bird, and made some excellent choices while doing so. For example, notice how most of my screenshots are of a baby version of Damini? That’s because Outerloop wisely included an in-game hat that keeps the bird in a younger, more manageable form. Adult-sized Damini takes up a lot of screen, especially when playing with a Dual Shock in either virtual reality or TV mode. Another wise decision on the part of the developers was giving the game two modes: Story mode with combat, and Imprint mode without. As much as I normally enjoy fighting robots, I did not enjoy flailing about with a laser whip in one hand while trying to direct Damini to attack with the other. I’d rather craft some food, harvest some vegetables and hunt animals with my best bird pal. I’ve played Falcon Age directly off the television using Dual Shock controls, and in virtual reality with a pair of Move controllers. There’s something magical about raising an arm in real life and feeling the subtle haptic feedback as Damini lands on my wrist. Targeting animals to hunt or items to gather is much easier with a Move controller—just point and click. That said, it’s easier to aim the game’s nifty electric whip with the Dual Shock, and in VR mode Ara only has hands and no body. Even her shadow on the ground is just hands. It’s disturbing. Either way it’s played, the bird bits of Falcon Age are delightful and charming. Story and combat feel half-baked, and we don’t learn much about the beautiful world the game takes place on. The whole affairs feels more like a showcase for awesome virtual bird technology than a fully-realised game, but it’s a super-endearing showcase. The birb is love.